Store-bought just can’t compare with homemade hot chocolate. Homemade is richer, creamier and just better! Warm milk in the microwave or on the stove until hot, but not scalding. Stir occasionally to prevent skin from forming. Stir in cocoa and sugar until smooth. 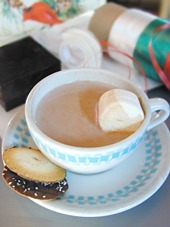 Pour into a mug and garnish with whipped cream or marshmallows, if desired. This entry was posted on Wednesday, September 19th, 2007 at 6:18 pm	and is filed under Beverages, Master Recipe Index. You can follow any responses to this entry through the RSS 2.0 feed. You can leave a response, or trackback from your own site.